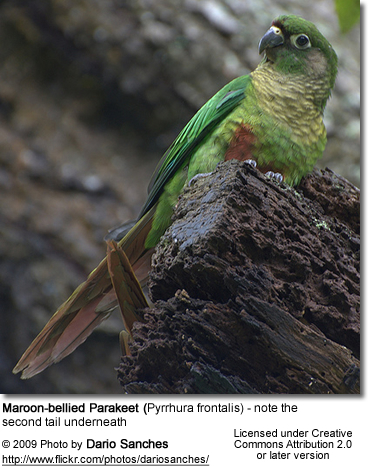 The Maroon-bellied Conure, Pyrrhura frontalis, is also known as Maroon-bellied Parakeet, Reddish-bellied Conure, Brown-eared Conure/Parakeet and Scaly-breasted Conure/ Parakeet. This conure is found in Southeastern Brazil through Northern Argentina, including Paraguay and Uruguay and maybe the Eastern tip of Bolivia. The Maroon-bellied conure is a smaller bird with an approximate length of 9 - 10 inches (25 to 28cm). The plumage is primarily green, with a maroon patch on the belly, a yellow-green barred ("scaly") breast and front and sides of neck, brownish ear patch, black beak, and maroon undertail. The primaries (longest wing feathers) are blue on outerwebs, green on innerwebs, and dark on the tips. 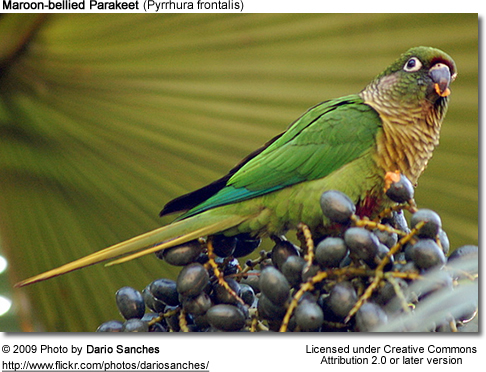 The Maroon-bellied Conure is often mistaken for the Green-cheeked conure. They are very similar in disposition and looks. There are some visual differences. The Maroon-bellied conure's tail is a green color on top and lightly maroon colored underneath, while the green Cheek conure's tail has a dark maroon color. The belly is somewhat darker than the Green Cheek's. They reach maturity at 1 to 3 years -- the smaller Conures mature more quickly. In a safe, healthy environment, they can expect to live up to 35 years. 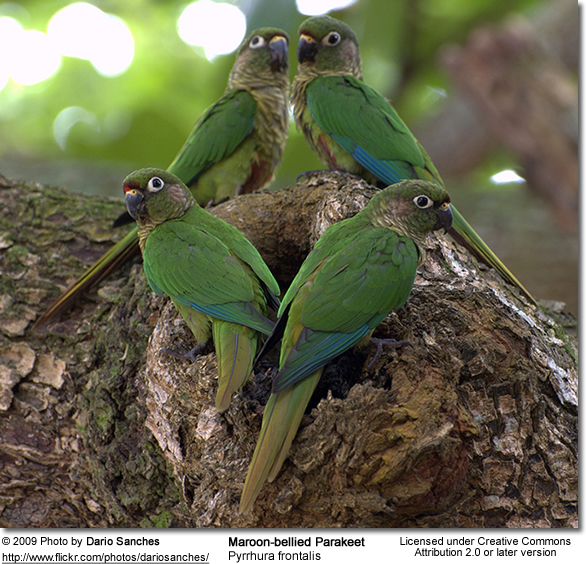 The Green-cheeked Conure is more available than the Maroon-bellied Conure. Maroon-bellied conure prices vary from $125 to 250 Dollars, depending on location and availability. The Maroon-bellied Conures are intelligent, friendly and active. They adapt easily to human contact and are easily trained. They are bold and independent and yet generally have a very sweet personality and they are growing fast in popularity. Maroon-bellied conures can learn to talk, although not clearly. They are among the quietest conures, but their shrill voices could potentially upset the neighbors of apartment dwellers or annoy those that are sensitive to noise. Like other conures, they tend to express excitement with a series of loud, shrill screams. Like many parrots, they also like dunking their food into their drinking water -- creating a messy soup requiring the water to be changed frequently. A water bottle may be a good choice, if you are not able to change the water several times a day. Many of them enjoy bathing or showering with their owners. Bathing water needs to be provided daily. Maroon-bellied conures generally love to eat fruits and vegetables, which should be provided to them daily in addition to a good quality seed mix. Conure Diet / Feeding. 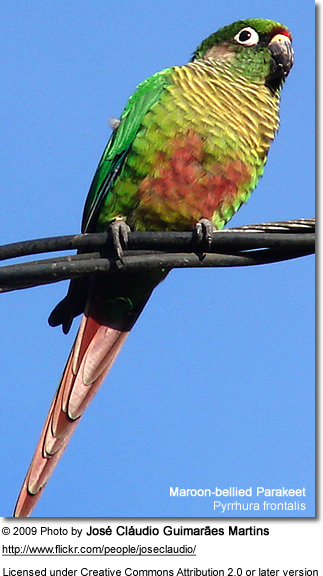 The Maroon-bellied Conures have big personalities for such small birds. Owners report that they are smart and interactive, but are also more prone to behavioral problems than are cockatiels or budgies - but this would be the case with any conure. They all require a committed owner who will work with their pets to guide their behavior, while cockatiels and budgies are "beginner birds." Maroon-bellied conures are cuddly birds. However, individual differences do exist, as some maroon-bellied conures will accept cuddling only on their terms. But these are the exception to the rule. Most seem to thoroughly enjoy cuddling whenever their favorite human is available. Visual difference from nominate form (described above): Tail shades yellowish, sometimes orange-red at wing bends.